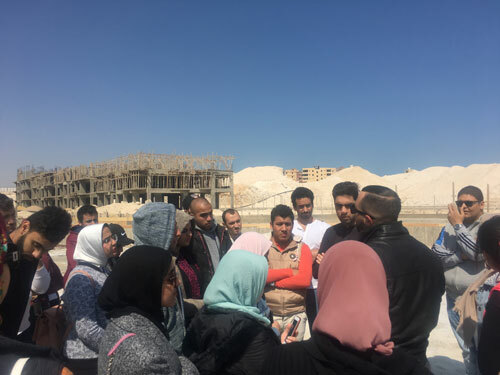 Under the auspices of Prof. Ramdan Abd-El Maksoud, the Head of Architectural Engineering Department, two field trips were organized to the construction sites of Row Marina Resort in Al Alamin; being marketed by Rufaida Real Estate Company and implemented by Al Samadi Group and Rosana Resort (North Coast- 56km). This was held on Saturday 02/03/2019 for the third year students. The trip aimed to link theory to application. The trip supervising team included Dr. Mohamed El-Fakharany, Eng. Amany Haredy and Eng. Ehab Ibrahim. The students were informed on the latest techniques of building swimming pools as well as its isolation system. 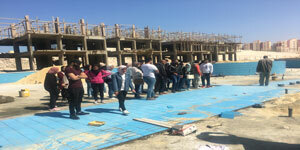 The site engineers also explained the building stages to the students from the concrete structure to the finishing stages. The students were also acquainted with different types of swimming pools: overflow and skimmer through the building process. The students gave a report with photos and notes that they have taken during the trip.